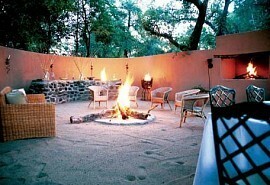 This 14-night premier safari offers guests the opportunity to explore the highlights of the Kruger Park and Mozambique. This itinerary includes the famous Kruger Park Private Concession, the world renowned Sabi Sand Reserve and the tropical island paradise of the Bazaruto Archipelago. From USD 14 000 per person. This is subject to change depending on season and availability. On arrival at Johannesburg airport, guests will be met by a representative and assisted to their light air transfer to Singita Sweni in the Kruger Private Concession. Guests will spend 4 nights at the lodge enjoying activities such as open 4x4 game drives and guided nature walks. Singita Sweni Lodge is situated on the banks of the Sweni River and is built from glass and slatted wood, creating a subtle air of luxury blending in with its surrounds. 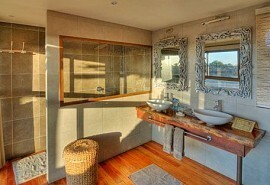 Suites have private wooden game viewing decks and outdoor showers. 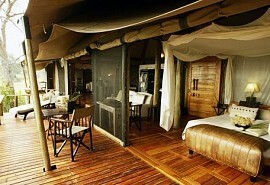 Singita offers award winning safari lodges in prime game viewing areas. After breakfast and morning activities, guests will be transferred via light aircraft to Singita Boulders in the Sabi Sand Reserve where they will spend 4 nights. Activities at Singita Boulders Lodge include open 4x4 game drives and guided nature walks. Singita Boulders Lodge is another exquisite contemporary lodge offering a tranquil atmosphere and excellant game viewing. Guests can enjoy panoramic views of the Sand River - a popular area for wildlife viewing. After breakfast and morning activities, guests will be transferred via light aircraft to Johannesburg airport. Here they will hop on the complimentary airport shuttle to the D’Oreale Grande Hotel and stay overnight. D'Oreale Grande Hotel is an exquisite 5 Star hotel located in Emperors Palace in Johannesburg. It's a true glitzy, city hotel complete with casino and health spa. 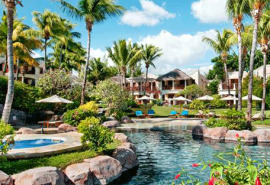 Azura luxury boutique resort comprises of villas situated on the beach. Surrounded by palm trees and turquoise seas, Azura is a a true tropical paradise ideal for honeymooners. Spend your days relaxing on the beach, diving in one of the many reefs or relax in your own private plunge pool at your villa. After breakfast, guests are transferred by helicopter to Vilanculos airport where they will take a scheduled flight back to Johannesburg in time for their onward travel arrangements.